Gujarat Education Department has published a Advertisement for below mentioned Posts 2016. Other details like age limit, educational qualification, selection process, application fee and how to apply are given below. Bachelor of Law. Knowledge of Gujarati and English languages essential. Experience of 2 years essential. Handling legal matters in Govt. office/undertakings desirable. Bachelor of Law. Knowledge of Gujarati and English languages essential. Any Graduate and Basic knowledge of Computer, Typing knowledge of English and Gujarati. Selection Process: The qualifying and short listed candidates will be invited for the test and interview before the Committee. The test may include a case study and other aptitudes essential for the following posts. The incumbents shall report to the Legal Advisor (Legal Officer) of the Education Department. 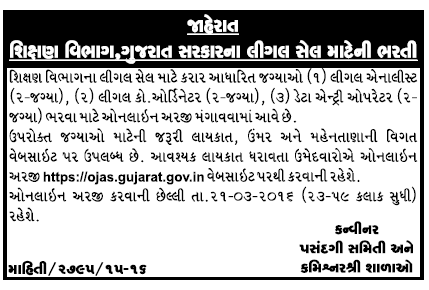 How to Apply : Interested Candidates may Apply Online Through official Website https://ojas.gujarat.gov.in.